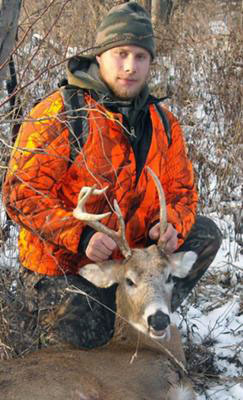 On November 28, 2010 I took a 5-point non-typical buck while hunting with my dad in 8g located just outside of Batavia NY. It all started a 5 am when I woke up with a fever. I called my dad to tell him that I wouldn't be able to make it that morning but would try to make it out for the afternoon. I ended up getting to our hunting spot at about 1:30 pm and it took all the energy I had to drive a half hour and make it up a tree stand. I think my dad felt a little bad for me since I came out still feeling pretty sick. He told me to just stay put in my stand and he would put on a slow push through this one area that is mixed with pine trees and goldenrod. The area is about 250 yards long and about 50 yards wide. Well, my dad got about 50 yards through the area and out came a buck. The deer stopped at about 50 yards out and I had a decent shot but the goldenrod was so thick I couldn't really see where I was aiming. The deer went about another 10 or 15 yards and stopped broadside and I pulled the trigger. I knew I hit him but thought it might have been a little far back. We waited about 30 minutes before looking for the first blood and when we found it we realized that I had hit him pretty good. The blood trail was about a foot wide. We followed it for about 30 yards and there my deer lay. Upon gutting it we realized I blew up one lung and knicked the other. Now lets have a flashback to the opening day of bow season. Just at last light my buddy shot what he thought was a 4 point buck. We couldn't find any blood that night and went back the next day. We did find first blood but it only went about 10 yards and ended with an arrow that had the tip broke off of it. There was no blood on the area. After searching some more we found no more blood and no deer. Figuring it was a shoulder shot we highly doubted the deer was even dead. Sure enough, when we find my deer there is a rage broadhead (which my buddy shoots) in the deers front right shoulder which is the shoulder my buddy hit. I guess it really is a small world!!! !